Kyle Miller MSIS | Interdisciplinary explorations in sustainability. The American Heritage® Dictionary of the English Language defines self-aggrandizement as: “The act or practice of enhancing or exaggerating one’s own importance, power, or reputation, esp in an aggressive or ruthless manner.” I define it as the single quality to which my personality is most averse, which is to say that I pride myself on maintaining a certain degree of dignified humility. My reservations about signing up for an account on the professional networking site LinkedIn stem almost exclusively from this point: I am not a salesperson, particularly when the product I’m selling is myself. This is, of course, a gross mischaracterization of what LinkedIn offers, and how it differs from the less professionally minded social media platforms. At its core, it is a connection-based networking site, with a heavily moderated relationship “request” system. The intent is to prevent users from engaging in professional popularity contests, in addition to reducing spam. Groups provide a means of connecting via industry, workplace, or interests, while an organized job listings database matches users with opportunities suitable to their qualifications. An aggregated news feed provides updates from within a user’s network, as well as providing business news from around the world. These minimal differences from platforms such as Facebook, however, have had vast implications for the type of digital community that has developed on LinkedIn. Capitalism is, by definition, highly competitive, and some of the more unsavory aspects of employment seeking and professional networking manifest themselves on the website. User profiles are rife with meaningless corporate language, one-upmanship, and “creative intimidation,” which can be overwhelming (or nauseating) to the newcomer. Etiquette enforcement, and elitism more broadly, also serves to make LinkedIn one of the least inviting social networking platforms, which is only exacerbated by paid account options. Does this mean that LinkedIn cannot be adapted to meet the needs of the casual user, who would prefer not to objectify themselves? Certainly not, but I would argue that LinkedIn’s core demographic is that of the overly opportunistic go-getter, followed closely by the desperate jobseeker, and this is reflected in the dynamics of the community. It can be difficult for the casual user (or casual jobseeker), to not feel alienated—a seemingly paradoxical condition in the social networking sphere. Nonetheless, LinkedIn is a powerful platform, which I’ve personally found to be marginally fulfilling. If nothing else, its reputation as an appropriate space for one’s digital resume is advantageous, and I have little doubt that meaningful professional relationships can be forged on the platform. My numerous qualms with the websites are largely the result of my own subjective beliefs on what constitutes exploitation, self-aggrandizement, and objectification, but even these concepts are regularly in flux. As the enormously popular website continues to enjoy exponential growth, one could reasonably conclude that the site is, if nothing else, providing a unique service which successfully meets the needs of many aspiring & established professionals; I’m still undecided as to if I’m one of them. In our increasingly globalized society, today’s workplace is composed of a magnificent and unprecedented degree of diversity. Individuals from all generations, ethnic backgrounds, and cultures, seamlessly interact in the shared pursuit of collective prosperity. The meet these goals, effective communication is imperative, which is in itself not a new challenge, but has been made more complex as a result of the digital revolution. To identify instances in which misunderstandings may occur, it may prove beneficial to also reject traditional demographic cohorts, known as generations, in favor of a more relevant measure: relationship to the Internet epoch. I had the pleasure of interviewing an individual who might be described as a “younger boomer,” or perhaps an “older Generation X’er.” Indeed, she has always viewed herself as being born between the generations, identifying with a number of qualities commonly attributed to each of the two. One thing that is for certain, however, is that she had the opportunity to witness the extraordinary transformation in the way we communicate, from the advent of the personal computer in the early 1980s, to the ubiquity of social media in the mid-noughties. “I distinctly recall registering for my courses as an undergraduate using IBM punchcards, which were fed through machines that automatically calculated enrollment figures,” she reminisced. “Being from a small town in rural Tennessee, it was my first exposure to digital technology; I had never imagined I would someday use computers daily in my banking career—much less for pleasure.” She admits that, while at times the learning curve was steep, the convenience provided by computing made the experience less arduous—and perhaps a bit exciting. So why had Facebook proven so popular among her demographic cohort? And do they really “get” what it’s all about? She argues that, while baby boomers may not always prove to be as digitally proficient, they do have a greater appreciation for its convenience and benefits. Lest we forget, it was this generation who witnessed the commitment of unprecedented resources to advance technology in the Space Race, culminating in Neil Armstrong’s footsteps on the moon in July of 1969. The technology used at the time was, in fact, much less sophisticated than that used in a graphing calculator, but it accomplished a feat of ineffable greatness. “But I suppose there are two sides to the coin, ” she opines. Those of humble beginnings may object to the trivial or leisurely use of such powerful technology, or find it altogether unnecessary. Ultimately, however, she believes that social media and the Internet is here to stay, and uptake among older generations will continue. “People have always needed to feel connected, either through paper correspondence, telephone, or email; that’s something that isn’t going to change.” Fear of change, too, is an inherent piece of the human experience, but with a bit of curiosity and patience, we can bridge generational divides to make the Internet an indiscriminate and fluid space. I would suggest that the usage patterns of my interview subject and myself are not necessarily typical of our respective generations, and this supports the thesis of my post: I am not wholly convinced in the benefit of dividing the digital public into traditional demographic cohorts; the exception may indeed be the rule. However, some commonly held beliefs about how younger and older generations use social media were consistent. For example, while my interviewee spends more time on social media than I do, much of her time is spent engaging on a single network (Facebook) and through a single medium (personal computer). While I spend less time on social media overall, my time is divided among a handful of networks (Twitter, Instagram, LinkedIn) and through multiple platforms (personal computer and iOS). Although my sessions are significantly shorter, they are perhaps more numerous and more evenly distributed throughout the day. Conventional wisdom would suggest that, in structuring a social media campaign to engage the largest possible audience, distinct approaches are necessary to reach older and younger generations. An email campaign formatted as a newspaper article with an embedded video would seemingly appeal to baby boomers, because the digital versions of familiar media are being utilized. Similarly, mobile applications would appeal to members of Generation Y, because they grew up in parallel with the platform. I would caution, however, against a tendency to rely solely on these stereotypical usage patterns in developing a social media campaign. Age, I would argue, is becoming an increasingly less relevant measure of demographic significance in the digital sphere, and perhaps more progressive approaches will be necessary in the future. Social media spreads its wings to reveal its greatest potential in times of crisis. 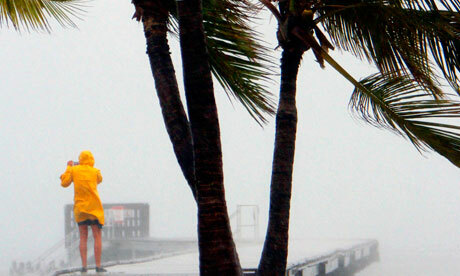 Witnessing Florida and the Gulf Coast brace for the impact of Tropical Storm Isaac, I am reminded of the fascinating role that social media played in the Hurricane Irene and the UK riots that occurred in August of last year. Although the latter was an “unnatural” disaster, many of the resulting effects were similar, such as property damage, garbage pileup, abandoned vehicles, and disruption of essential services. After order was restored, citizens were quick to utilize social media to coordinate cleanup efforts in their communities. #ukriotcleanup was a trending hashtag on Twitter for a number of days after the riots had ended. Such efforts were neither facilitated nor condoned by city councils or elected officials, and in some cases were discouraged due to safety concerns. Nonetheless, the citizens were undeterred in their commitment to self-organize and restore their communities. The rioting has brought a different kind of people out onto the streets, other than the rioters. Volunteers are using social media networks to organise mass clear-up operations – and show solidarity in the face of the threat from those bent on violence. In the case of Hurricane Irene, which heavily affected the densely population metropolis of New York City, the public were quick to utilize the resource established by officials to disseminate their own reports. I suspect this is part of a broader sociocultural shift, in which people derive comfort not only from receiving news/updates, but also from providing their own. This rather neatly connects to examples from Hurricane Katrina, in which people had developed an increased skepticism at the very concept of an “official” report. The most valid corroboration of information has become that which is gathered by those in your own backyard—either physical or virtual. A sense of overarching empathy develops from these shared reports—a certain consolation in knowing that you aren’t alone in your experiences. And finally, there is the comfort of apparent manageability. While cleaning up a vast urban space such as New York City after a natural disaster may seem an insurmountable (and consequently demoralizing) task, having a community-devised inventory of damages make cleanup efforts appear far more manageable. Although a bit of a tangent, I think it’s worth returning to the UK riots, if only to highlight an interesting point about using social media for good in times of crisis. In an impossibly large city such as London, it’s extremely difficult for traditional media outlets to provide timely updates regarding conditions on every borough, neighborhood, and street. Riders on the London Underground depended on Twitter, asking which stations would be safe for exit, not having the luxury of knowing the conditions at street-level. Brave citizens also organized to defend their own shops and neighborhoods from looters, most notably in the case of the predominantly Islamic communities of North and East London, who may have been disproportionately targeted. The Metropolitan Police of London, Manchester, and Liverpool all used Twitter to inform the public of particularly dangerous areas, in addition to their progress in arresting/controlling rioters. The Guardian compiled location data from Twitter to create an animation mapping the “riot commute,” which can be viewed on their on their website here. It is precisely this sort of absolute transparent engagement with the public that is needed to reveal the value of social media. While the City of New York may have only been getting their feet wet, I applaud their willingness to do so. Description: Established in 1987, the Botanical Research Institute of Texas (BRIT) is global botanical research institute and learned center based in Fort Worth’s Cultural District. In the Spring of 2011, the BRIT moved into a new 70,000 square-foot facility based on the campus of the Fort Worth Botanic Gardens. Designed by Hugh Hardy of H3 Hardy Collaboration Architecture, the building is certified LEED-NC Platinum by the USGBC. + Beck Construction was contracted for materials sourcing, site development, and planning. + Facility was not merely designed to meet LEED specifications, but also the needs of the BRIT itself. + Sustainable features divided into four categories: site selection/characteristics, water efficiency, energy & atmosphere, and indoor environmental quality. + More than 76% of the developed site has been restored to a native ecosystem: North Texas prairie. + Green roof, more appropriately called a “living” roof, is carpeted with plants reduces heating/cooling needs and provides a habitat for native flora/fauna. + Indigenous/xeriscape landscaping drastically reduces water consumption. + Onsite retention pond stores stormwater runoff to be used for irrigation. + Rainwater catchment cistern collects runoff from the living room, also to be used for irrigation. + Geothermal wells used to regulate temperature throughout the facility and reduce energy costs. + Photovoltaic solar array on the herbarium provides 14% of the building’s energy needs. + Low-flow fixtures and other water efficiency measures reduce consumption by 60% over EPA standards. + Sustainably harvested or renewable materials, such as wool carpet and bamboo ceilings, were used whenever possible. + Recycled materials used for over 20% of BRIT’s building materials. Conclusion: Since moving to Fort Worth, I have always had the desire to the explore the BRIT’s facilities, admittedly for its aesthetic qualities. Many of the LEED certified spaces I’ve had the opportunity to tour have been somewhat disappointing—apparently sacrificing form for function (or efficiency). Moreover, the occupants of the building are either less than appreciative of its sustainable features, or simply indifferent. In the case of the BRIT, it is clear that the organization’s involvement in the design process has resulted in long-term awareness and stewardship of the facility itself. Indeed, it seems the operational mission of the BRIT and the principles of sustainability have integrated seamlessly, aided by an appreciation for the built environment which it now inhabits. Owner's residence on Hibiscus Hill Plantation. Description: Hibiscus Hill Plantation is an organic production and demonstration farm located in Waller, Texas, approximately 45 miles northwest of Houston. Owned by Georgia and Richard Bost, the farm specializes in pasture-fed beef and poultry, which it sells at Georgia’s Farm to Market in Houston. 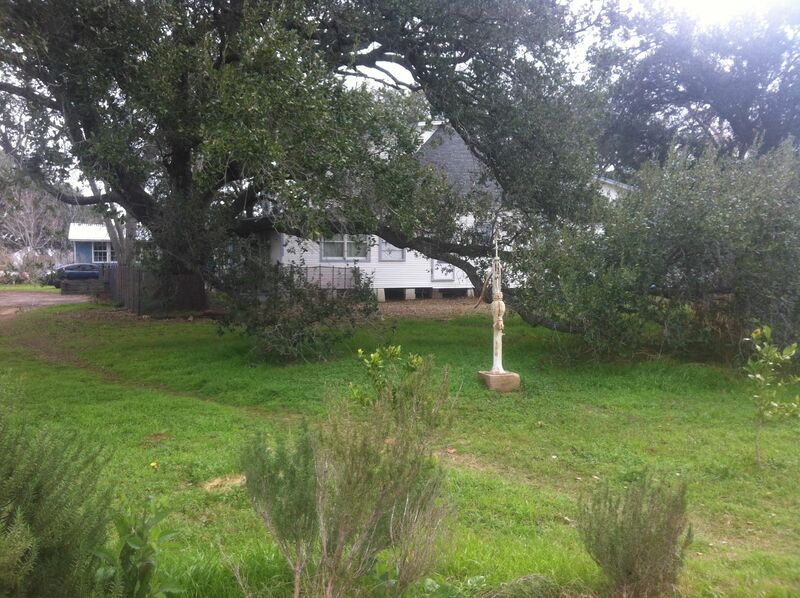 + Land in Waller County was purchased in 1999. + Public education and demonstration of organic farming practices was intended from the start. + No antibiotics used unless absolutely necessary. + Farm occupies 270 acres of land, comprised of orchards, crop fields, and grazing pastures. + Approximately 1,000 chickens are kept at any given time. + Poultry are also pasture-fed with limited corn intake. + Grassfed beef is shown to be significantly more nutritious than (now) conventional corn-fed beef. Conclusion: As the final visit of the Central and South Texas portion of our study tour, Hibiscus Hill Plantation was equal parts refreshing and enlightening. In the sustainability discourse, much time is spent discussing ways in which we can reduce our energy and resource consumption, but it’s frequently concerned only with raw Earth minerals/materials. Food, on the other hand, is something very personal to all of us, and I believe it’s crucial for us to reacquaint ourselves with the source of our sustenance. While we’ve all heard that it’s more sustainable to purchase locally from farmer’s markets, visiting a production farm facilitates a better understanding of the logistics of our food system—fostering a lasting sense of appreciation for both farmer & animal welfare. 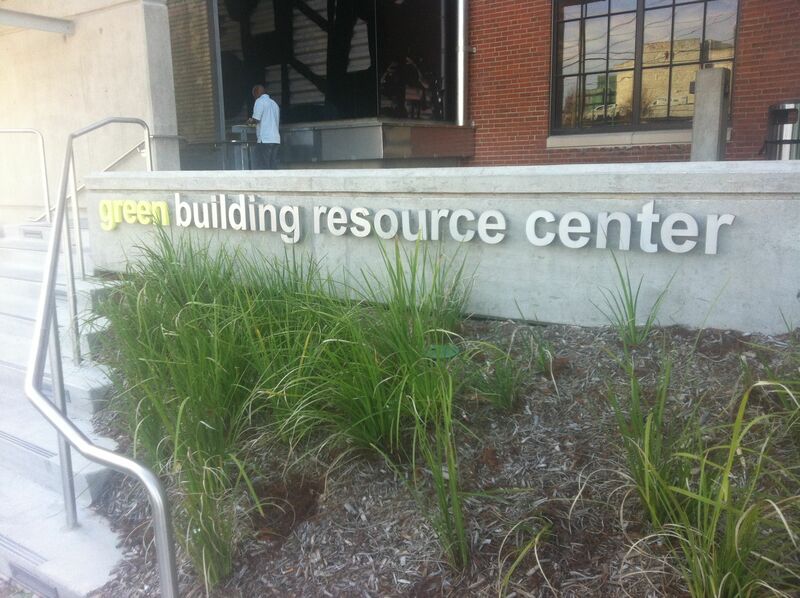 Houston's Green Building Resource Center. 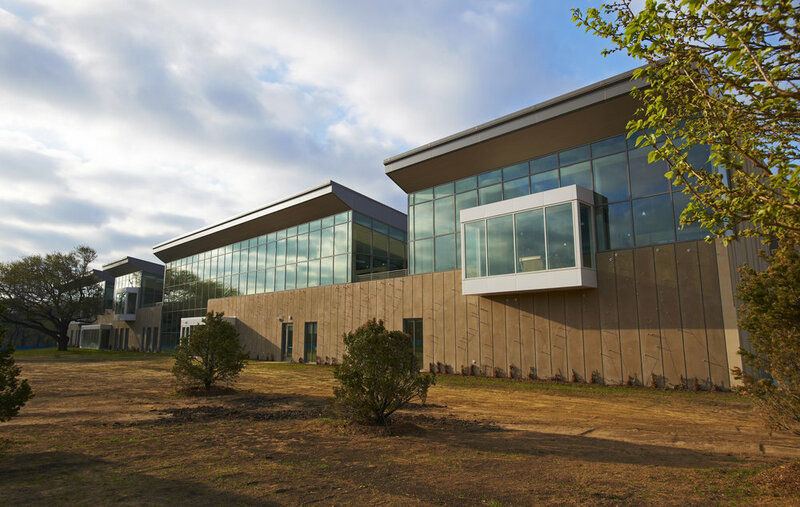 Description: Officially launched on Earth Day of 2009, Houston’s Green Building Resource Center serves as a permanent exhibition space for green solutions, targeting homeowners, builders, and general contractors. The Center shares space with Houston’s Permitting Center, in a repurposed building on the north end of Downtown. + Studio Red Architects were responsible for the refurbishing the Center’s current space, a general warehouse originally built in 1916. + The facilities were built with adaptive reuse in mind, cognizant of the changing logistical needs of municipal government. + Building is certified USGBC LEED Gold, featuring a raised floor system (which improves air flow), recycled construction materials, and a rooftop solar array. + Large rainwater catchment system is used to reduce water consumption due to irrigation. + Exhibition spaces aims to be interactive and accessible to the general public, not merely to homebuilders. + Audio/video displays and exhibits demonstrate sustainable concepts. + Onsite classroom available for instructional sessions, which are open to all Houston residents. + All products featured in the showroom have been vetted for their compliance with the City of Houston’s building code. + Variety of free material samples and educational pamphlets are available to the public. Conclusion: Prior to visiting Houston’s Green Building Resource Center, I was slightly surprised at the notion of the city investing public funds in a sustainability education/awareness venture. Given Houston’s overwhelmingly laissez-faire approach to zoning/building, one might expect the city to have little interest in the promotion of energy efficiency or environmentally friendly construction materials. However, two things were apparent to me: one, the Center appears to operate on a very small budget (materials and products are sponsoring by private companies); two, instead of providing an infrastructure intensive service, the emphasis is on public education & information sharing. I believe such an approach definitely has its place, and it would be easily adapted to other markets (including the Metroplex). Rendering of Discovery Green Park. Description: Discovery Green is a 12-acre park created in 2004 by a public-private partnership between the City of Houston and the non-profit Discovery Green Conservancy. 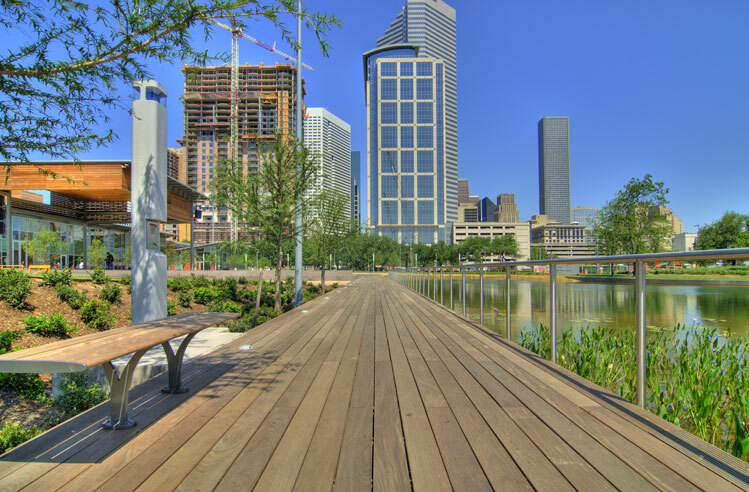 According to its website, the Discovery Green “was conceived not only as a public park, but as a landmark to attract convention revenue to the City, and as an anchor for downtown development.” The onsite facilities have been certified LEED Gold by the USGBC. + Two large parking lots, divided by a narrow green space known as the Houston Center Gardens, were originally situated on the property. + Philanthropists led by The Brown Foundation and the Kinder Foundation led the initial appeal for an urban park to be created on the land. + Mayor Bill White approved the project, advocating for a public-private partnership. + PageSoutherlandPage managed the LEED certification process for the park. + The park aims to be a living “green” education & awareness space. + Achieved Corporate Lands for Learning (CLL) certification from the American Wildlife Council for the establishment and documentation of site-based education programs through providing exemplary conservation education experiences for the community. + Has numerous energy efficiency measures, including solar arrays on each of the main park buildings, the Alkek Building and The Lake House. + 20% of the materials used came from regional sources, and more than 60% of the Ipe wood used to construct the park came from sustainably-harvested forests. Conclusion: Simply stated, Discovery Green Park is a beautiful public space in the heart of downtown Houston. Having had the opportunity to visit the park in the afternoon and at night, I can attest to its vibrant attraction to the local community. My concern, however, is that the park may have taken the concept of “urban oasis” a bit too far, as I found the numerous decorative/play fountains, misting stations, and ice-skating rink to be somewhat excessive—perhaps even wasteful. The concept and existence of the park is decidedly a good thing, but it does raise interesting questions about the malleability (or over-flexibility) of LEED’s point system.